First, just wanted to let you know that Michelle Patterns (formerly Keyka Lou) is having a big Labor Day pattern sale this weekend! 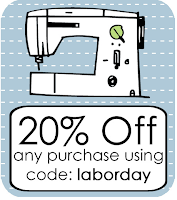 You can take 20% off ANY purchase using the discount code laborday. Woohoo! The sale starts today and runs through Monday, September 3rd. Isn't it beautiful? I love how she used scrapbook paper and embellishments in each pane. It really adds a lot to this piece. Love it! Make sure you check out Erin's post for all the details on her fabulous project. Thank you so much for featuring my frame. I'm loving your blog! Such inspiring ideas!